Introduction to Audio Analysis serves as a standalone introduction to audio analysis, providing theoretical background to many state-of-the-art techniques. 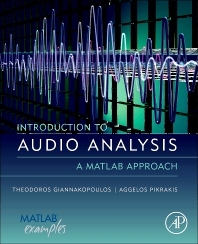 It covers the essential theory necessary to develop audio engineering applications, but also uses programming techniques, notably MATLAB®, to take a more applied approach to the topic. Basic theory and reproducible experiments are combined to demonstrate theoretical concepts from a practical point of view and provide a solid foundation in the field of audio analysis. Audio feature extraction, audio classification, audio segmentation, and music information retrieval are all addressed in detail, along with material on basic audio processing and frequency domain representations and filtering. Throughout the text, reproducible MATLAB® examples are accompanied by theoretical descriptions, illustrating how concepts and equations can be applied to the development of audio analysis systems and components. A blend of reproducible MATLAB® code and essential theory provides enable the reader to delve into the world of audio signals and develop real-world audio applications in various domains. University graduates and R&D engineers needing a firm understanding of the fundamentals of audio analysis. Theodoros Giannakopoulos is a Research Associate in the Institute of Informatics and Telecommunications, National Center for Scientific Research DEMOKRITOS, Greece and in the Department of Informatics & Telecommunications of the University of Athens (UOA). He received his Ph.D. degree in Audio Analysis from UOA, in 2009. His main research interests are pattern recognition, data mining, and multimedia analysis. Research Fellow at the Institute of Informatics and Telecommunications, National Center for Scientific Research DEMOKRITOS, Greece and within the Department of Informatics & Telecommunications of the University of Athens (UOA).